While we all missed seeing Toby in the recent Pretty Little Liars Halloween episode, the actor that brings Toby to life has definitely not been relaxing during his time away from Rosewood. 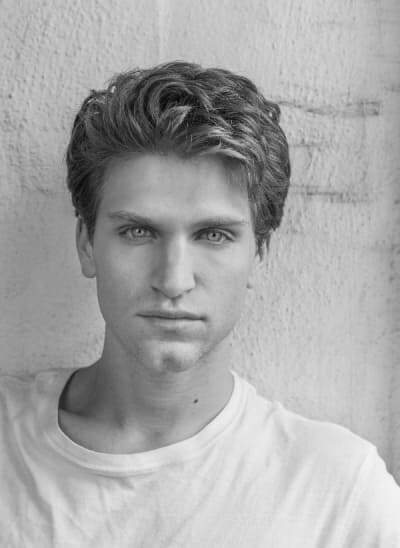 Keegan Allen is currently appearing in the Off-Broadway MCC Theater production of John Pollono’s "Small Engine Repair," which began preview performances this week in New York City. With co-stars in the play like James Badge Dale (World War Z), James Ransone (The Wire) and the playwright, Allen told me recently in New York City that his role in Pollono’s play is worlds apart from Toby and, as he repeatedly stressed, this is also not a play whatsoever for the teen audience that swoons every time he appears on Pretty Little Liars. During the following Q&A, the actor talked more in-depth about the play, why he goes back to the stage once the cameras stop rolling as well as what we can expect once new episodes of PLL start airing in January. TV Fanatic: Tell me about the play and how you came to be a part of it. Keegan Allen: It's called Small Engine Repair. It was written by John Pollano who's also starring in it, as well. It has James Badge Dale, James Ransone. And it is a psychological thriller comedy. And it's very, very mature. In fact, I've been stressing through all my social media not to deceive anybody, not to like confuse parents of my demographic coming. TVF: So, basically, this is not for thirteen-year-old girls. KA: It is not. It's literally NC-17. And it's very extreme. It's a very extreme play. You're locked into your seat from the moment it starts. It's a one-act and it's a revved up engine from the moment it starts and just plows through. It was originally in Los Angeles and it did really well there. So, this is now brought here with MCC. MCC's a huge company that just puts on great productions. They've spared no expense on it. They've just made it into an incredible display. TVF: What's your part in the show? KA: I play Chad Walker. And he kind of is a mixer of the play. He's the antagonist. He comes in and these three former high school best friends reunite under very shady circumstances. And Chad kind of comes in and mixes it up and unearths a lot of animosity between them. It's just really intense. As John described the character, he's very much a rollercoaster. He's an up and down character, Chad. TVF: So, it sounds like your character's not too light. Like he's the darker one? KA: He's not light. None of these characters I feel are light. They're very heavy, deep-seeded issue, you know, walking around with a lot of weight to them. It's totally different than anything I've ever played in the past with any movie or the television show. TVF: Is it safe to say that as soon as you have time off from the show that you gravitate to the stage? KA: Oh, yeah. Definitely. I mean, I went to school for theater. And the craft of acting is very much honed on stage. It's so easy to kind of forget the process when you're in TV because it has to be so quick. You know, writers come in and it is just very much for the writer. It's very much for the director for movies. And the stage productions are very much for the actors. TVF: Is there any romantic story for you in the play? KA: No. There's no romantic story. There are women involved [in the play] that are off-stage. And these, the men that are involved in this, the women kind of are the reason for all of this drama. As is life. TVF: Outside of Small Engine Repair, what’s on your bucket list of roles you want to play someday? KA: The Glass Menagerie. The Gentleman Caller is one of my favorite roles…I would love to play at the Booth Theater [on Broadway]. That's one of my favorite theaters. The Lucille Lortel, where we're doing our play, is another favorite theater. My bucket-list thing would be to play Jerry in The Zoo Story at the Booth Theater. Edward Albee is one of my favorite contemporary playwrights. TVF: I would assume that being on a hot show like Pretty Little Liars, does it open up doors for things like this? Or is this something that you kind of have to go after just for yourself? KA: I feel like I have to go after as if anybody would. I mean, none of it was handed to me as it was, none of it was handed to anybody else. Theatre's a very competitive world. It's actually more competitive, I think, than film and TV because it's a rigor. You have to kind of condition yourself. It's not like shooting a movie where you work for maybe ten hours or like four hours or like a week. You're doing eight shows a week. And you have to conditioned and you have to make very like strong choices and lock in a lot of what, you know, find nuances in your performance because you're doing it day. And there are no re-dos. It's all in one motion, the whole story on stage. TVF: You weren’t in the Halloween episode but you’ll be back in January in the new episodes. Anything we can look forward to? Where do things pick up? KA: It's an incredibly exciting season. The writers now have the freedom to kind of step more so into their favorite genres or their favorite ideas of how they want to play something. So, there's a lot more freedom within the show now. [Creator] Marlene King, [Exec Producer] Oliver Goldstick, [Exec Producer] Joseph Dougherty, and Bryan Holdman, Jonell Lennon…. I'm naming all the writers, but it's important. They all have taken on their own kind of persona when they write their episodes now. So you get a different flavor of the week. Even though the powerhouse of Marlene and Oliver and Joe come into play, now a lot of our writers are really coming into their own powerhouses and writing just incredibly gripping episodes. TVF: And for Spoby fans, can they be rest assured things are good for now? Or? KA: There are like any relationship on television, none of it's exciting unless someone throws a wrench in it now and then. But there are a lot of moments where you, in this next season, where people will feel helpless watching this relationship. Because there are a lot of issues that Toby's not going through, but that Spencer's going through. That no one can remedy. It's really, it's tough stuff. For sure. TVF: Okay. Do you miss playing bad like when we thought Toby was bad? KA: Yeah. I mean, it's always exciting to play, I guess, not the villain. That's so cliché. But to play a role that's a bit more abrasive and like the Boo Radley kind of character that he was is what people really like related to a lot and were intrigued by. But I definitely enjoyed that run. But I'm glad that the character has been very polarized and different throughout the seasons. You can look at Toby season one and season two, season three, season four, and he's completely grown up and changed. TVF: And your look has changed, too, on the show. Like, they've changed up your looks. KA: We were little babies! We were little kids when we started. Small Engine Repair started previews October 30 and runs through December 8. For more information on tickets, visit the MCC Theater site. Pretty Little Liars Season 4 returns January 7 on ABC Family.